Amazon announced Amazon Prime Air, a service that promises to deliver your Amazon order in 30 minutes or less. Using a small drone to deposit packages of up to 5 pounds in your yard, Amazon could give its users one more reason to pay for a Prime membership. There are numerous drone prototypes in the works, but the one showcased just recently by Amazon is a hybrid design that can take off and land vertically, and then once airborne, assume a horizontal orientation and become a mini airplane. The drones will fly under 400 feet and employ "sense and avoid" technology to deliver packages within approximately 10 miles of an Amazon warehouse. The consumer marks the landing zone with a placard featuring an Amazon logo on it and the drone leaves the package and takes off in a matter of seconds. While Amazon Prime Air still has many regulatory hurdles to overcome before it goes into regular production, there are also a number of other potential risks that must be considered. For instance, what about people shooting down drones that pass over their property? Would Amazon's overall loss prevention strategy improve with Amazon Prime Air? What if I placed my own landing marker in my yard continuously, just to fish? Would I be able to catch a stray drone delivery if it were close enough within the tolerable range of another drop off location? Are the landing markers unique enough to distinguish one customer from another? It will be fascinating to see how Amazon solves these technical security challenges. All risks aside, there appears to be enough of a potential benefit to Amazon and to the consumer that Amazon is even proposing revising the way airspace is managed today. 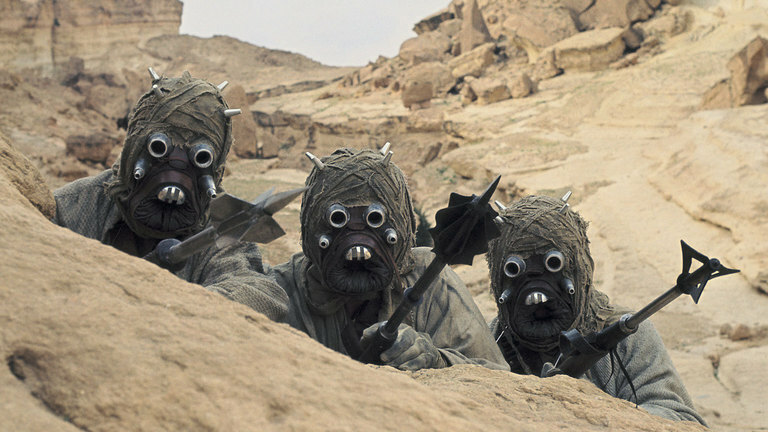 Let's just hope they've thought about how to deal with those pesky Tusken Raiders.